Well after only 4 days in Thaland so far, I already have too much information to fill you in on! Bangkok is a truely amazing place. It's mental, fascinating and certainly quirky. We've been able to get quite a few sites fitted in already. We've visited all the Bhudda's and the Golden Mount and yesterday went to the the Zoo, which was good fun. 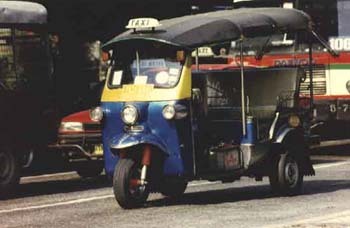 We've also had the pleasure of experiencing a few rides in a Tuk Tuk. They're good fun but you are risking your life when you get into one of these because the Thai's drive like absolute lunatics!! The heat out here is pretty unbelievable. It's so muggy and you sometimes feel like you can't breathe properly, but it definitely beats the winter cold I suppose. We've already had quite a few funny experiences. The first probably being when our Tuk Tuk driver abandoned us somewhere in the middle of Bangkok purely because we didn't want to go to some gem factory. Luckily we weren't too far from our hotel and managed to find our way back within 20 minutes. We also spotted our first lady boy! It was quite funny because despite the fitted jeans, long hair and make-up there was still no denying that this person was a bloke! The food out here is wonderful but extremely weird. I'm a bit apprehensive about eating anything from the street stalls apart from vegetable noodles. Some of the meat just looks so wrong and I reckon I'd be pretty upset if I ate something and later found out it was dog! All the Thai people do out here is seem to eat, it's crazy! And the smells that you get from the food as you walk down the street are pretty funky. Not what you want when you've got a raging hangover! Yesterday we were walking down the street and this guy was eating at his stall but I had to do a double take because I noticed something fall from his plate. As I looked closer I realised he was eating a plate full of live bugs! They were small white things that looked like grasshoppers and they were jumping everywhere. It was totally gross!! Jill and I were discussing trying some form of bug while we're here. I couldn't do a cockroach, possibly something much smaller and not as crunchy. I'll keep you updated on that one though. The shopping is amazing here as they have so much nice stuff and for dirt cheap. Shame I don't have more room in my backpack. We had a bit of a pampering session the other day and went for a Thai body massage (30 mins) and foot massage (45 mins). This cost us a total of 220 baht which is around 3 pounds. It was so good and I couldn't believe how cheap! Anything you could ever want or need is sold here and the prices really are untrue. The Thai people are so friendly and they really seem genuinely pleased that you've come to visit their country. You just can't walk down the road without stopping and talking to someone. Yesterday we got chatting to a Tuk Tuk driver who was trying to convince us to go to a Ping Pong show. Now for anyone who isn't sure what this is, in brief it's a show where women do all sorts of crazy tricks using a certain part of their anatomy........if you know what I mean. They love it out here supposedly. We've met quite a few other travellers over the past couple of days. There's loads of people doing similar routes or who have already been to the places we're going to later on. It's quite handy really because we've had quite a few reccommendations of where to go and where not to go and of good & cheap places to stay. Anyway, our time in Bangkok is almost up. Were heading up north tomorrow for our 15 day Tribal tour. This should be great fun hopefully and definitely interesting. Keep an eye out for my next entry because I'm sure they'll be plenty to fill you in on.